How many of your clients request a bigger design in a smaller space? Maybe they want the organization, storage, and convenience that a larger home would have? Many people have found themselves living in smaller spaces and need your help making the most of each inch. There could be a simple solution to this common issue. Try incorporating Smart Design into the remodel. What is Smart Design? Smart Design is the combination of using technology, organization, and lighting in cabinetry and other storage solutions to maximize all available space. 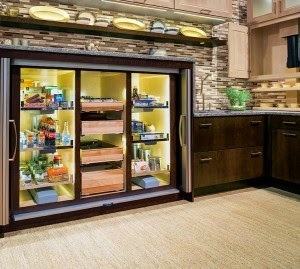 Explain to your clients that these are essentials to longevity and satisfaction when discussing their cabinetry needs. These three elements, when combined, can make the world of difference in their cabinets when it comes to maximizing space. Designing “smart” is not limited to a single room in the home but can be cohesive throughout transforming accessibility and convenience. Technology has become an everyday living necessity because of the added conveniences. Features such as touch-to-lift, touch-to-light, touch-to-open, and touch-to-close make accessing cabinets easy. 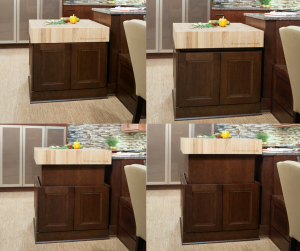 Countertops that lift and lower depending on the task at hand is another great example of innovative technology. As are cabinet shelves that lower to the countertop and lift back up for convenience, and closet rods that lower and lift maximizing space that otherwise would go untouched. Adding technology to a space can be as simple as putting in a charging station in a drawer that keeps electronics mess free while getting charged. With technology the possibilities are endless, so use it to your advantage. Chances are if you can make life easier for the customer, in the long run, they will be happy to recommend you! Organization is a crucial element when it comes to maximizing space, and it can be done several different ways. Organization can be as simple as putting like items in the same spot. You can even order cabinetry with tray dividers, spice rack pullouts, and other accessories that are made for specific items. Make sure your client knows the importance of keeping items organized and determine which way will best suit their personal needs. An often overlooked element of Smart Design is Lighting. But it is essential when it comes to locating items in cabinets. Share the importance of lighting to your client and explain to them how much space is lost in the back of the cabinet because it is simply not visible. And, of course, don’t forget to mention how great it makes the cabinetry look! Try to make your clients understand how important each of these elements are when it comes to getting the most out of small spaces. Smart Design is simple; however, it will make the world of difference! How have you utilized Smart Design concepts to deliver award winning remodels? Please share in the comments below.